Guinness cap is a black design that features the foreign extra label. 1759 is embroidered on the back of this Irish cap. 1759 is the year St. James’s Gate in Dublin, Ireland, became the home of Guinness. This Irish cap features an embroidered Guinness foreign extra label appliquéd on the front. This black Guinness cap is further enhanced with the harp logo and 1759 embroidered on the back of this 100% cotton flex fit hat that is designed to fit most adults. 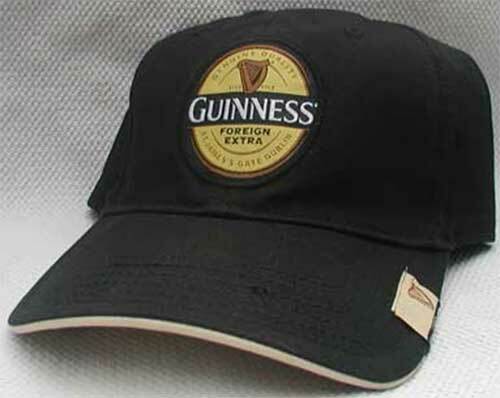 Guinness cap is an an embroidered design that features a functional metal bottle cap opener on the bill! Guinness cap is an embroidered design that features a green shamrock. Guinness cap is a black design with cream trim that features the classic Guinness label.